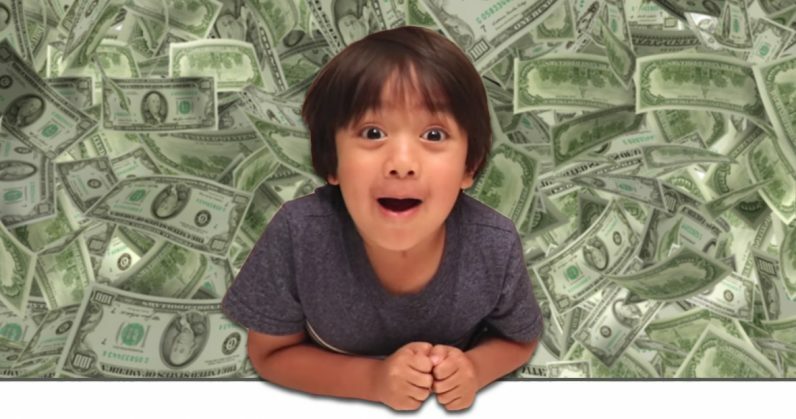 This 6-year-old made $11M on YouTube last year. What are you doing with your life? Six-year-old Ryan has the job most of us dreamed about when we were his age. For the last three years, he’s opened toys, played with them, and cashed checks that most of us can only dream of. According to Forbes’ new list of highest paid YouTube stars, Ryan of “Ryan ToysReview” earned about $11 million between June 1, 2016 and June 1, 2017, good for eighth on the list — tied with Anthony Padilla and Ian Hecox, of the popular comedy channel, Smosh. Ryan’s start was an unspectacular one. The train set his mother — who declined to be named — referred to was a Lego Duplo set. His family recorded the video, a 15-minute unboxing and playtime shot mostly ignored by YouTube viewers. It was a humble beginning, as is the case with most YouTube celebrities. But less than a year later, in 2016, Ryan had a million subscribers. He has 10 million currently. As The Washington Post said, Ryan’s popularity makes perfect sense. He’s got every small kid’s dream job, opening toys and playing with them, day after day. He’s smiley, too, totally nonthreatening to parents and children alike. No bad words. No preachy banter. He’s a miniature Mister Rogers but without the sweater and slippers. While the six-year-old may have your childhood dream job, Daniel Middleton has the job most of us would kill for now. With almost 17 million followers and 2017 earnings of $16.5 million, DanTDM, as he’s known on YouTube, makes his living playing video games in front of millions of engaged followers, much like PewDiePie, who 2017 wasn’t quite so kind to. Combined, though, the world’s 10 highest-paid stars earned an estimated $127 million last year, up 80 percent over the year prior. According to Forbes, the boost is mostly attributed to an uptick in views, including those from list newcomers like Ryan.